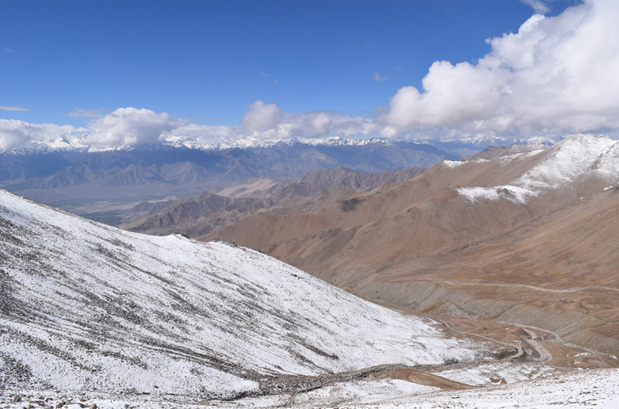 Passing through Khardung La, which is world's highest motorable road, the Nubra Valley Trek breaks open to a beautiful topography that was once was a part of a trade route between India, Tibet and Central Asia. It was an important platform for caravans following the Silk Road used for swapping their mules for the famous double-hump Bactrian camels. 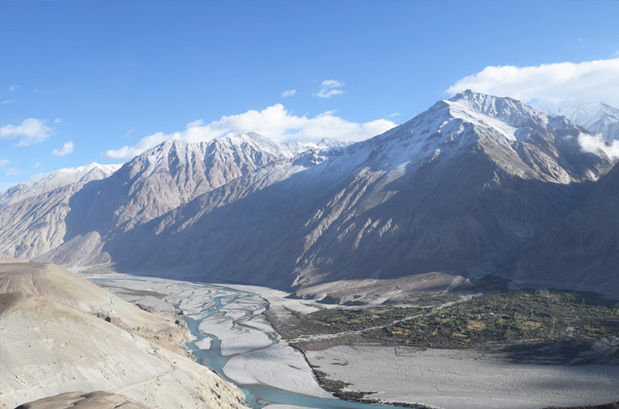 The river Nubra following in the region is a major tributary of the Shyok river that flows parallel to the Indus on the northern side of the Ladakh range. A rich variety of vegetation and orchids can be witnessed along Nubra River which results in adding colour to the valley. 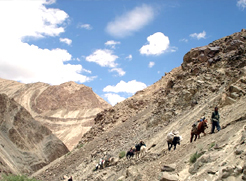 Today, Nubra Valley Trek is one of the moderate to challenging treks in Ladakh region that allow exploration of coloured steep and barren walls, remote villages and Gompas. The major attractions on this trek in Ladakh region are monasteries like Shey Gompa, which is approximately 15 kilometers away from Leh; Thiksey Gompa, which is at a distance of about 17 kilometers away from Leh and Hemis, which is situated 45 kms away from Leh and is ofcourse one of the most popular monasteries in Ladakh region. Further the journey proceeds to the unread lore of a culture hiding within the barren topography. 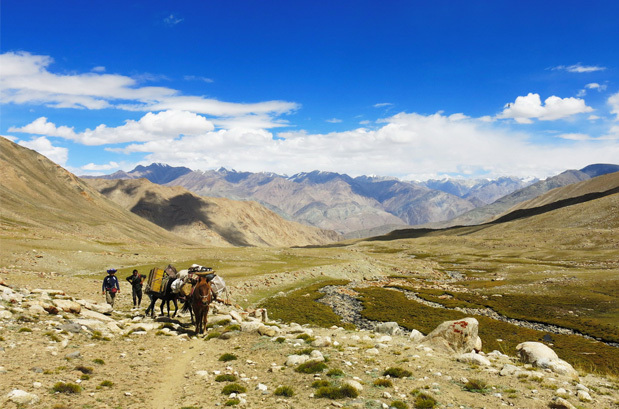 One can explore the remote villages like the Khardung, Khalser, Agyam, Khalsar, Tirit, Lukung, Tegar, Sumur and Diskit. Being one of the popular trekking trails in the Ladakh region, the Nubra Valley Trek attracts trekkers from different parts of the world. The valley is also often dubbed as "Valley of Flowers" and during the peak season it blossoms with varied colours flowers. 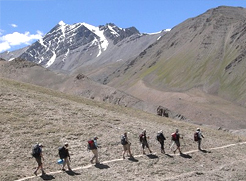 The Nubra Valley trekking trail passes through several high passes namely Digar La at 6000 meters and Khardung La. Thus, the trek by and large exhibits a land that is no less than a dreamland. The best time to visit Nubra Valley trek is between June and mid-October. During this time, the weather in Ladakh is pleasant and the average temperature ranges between 20 and 30°C in the daytime. July and August are the ideal months for Nubra Valley trek as during these months Manali-Leh and Srinagar-Leh highways also opens for private vehicles. Where is the Nubra Valley? Nubra is a tri-armed valley and is located in the north-east of Ladakh Valley. 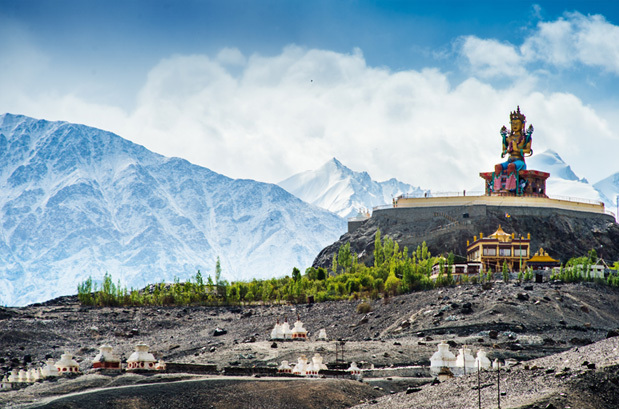 Diskit, the capital of Nubra region is about 150 km north from Leh town, the capital of Ladakh district, India. 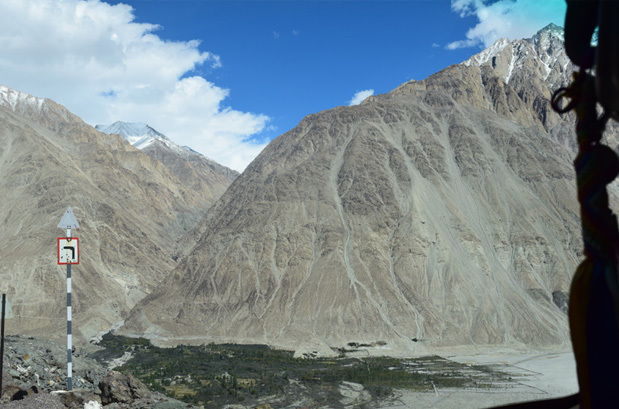 According to local scholars, the original name of Nubra was Ldumra, which means the Valley of Flowers. 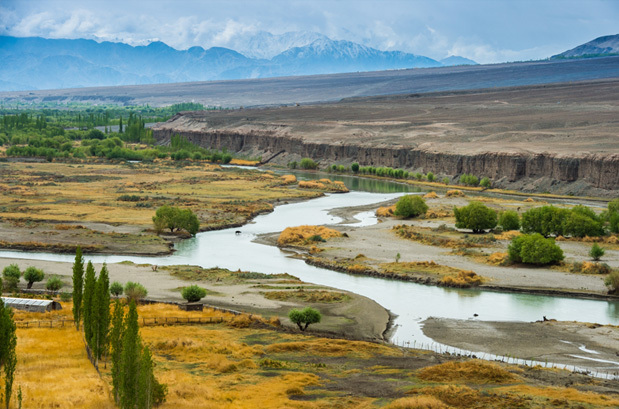 The Shyok River meets the Siachan River to form a large valley that separates Ladakh and Karakoram Ranges. The average altitude of Nubra valley is about 3048 metres above the sea level. 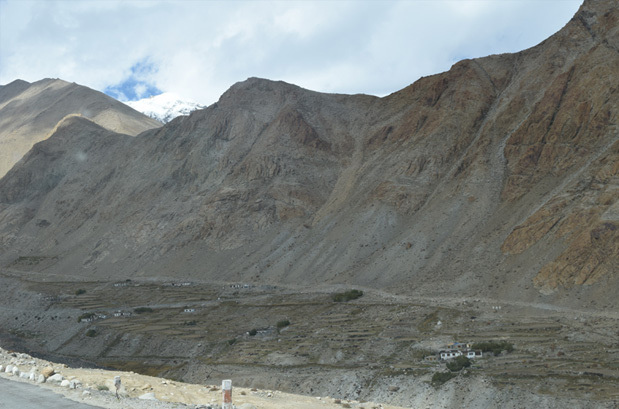 The common way to access Nubra is to travel over the Khardung La pass from Leh town. 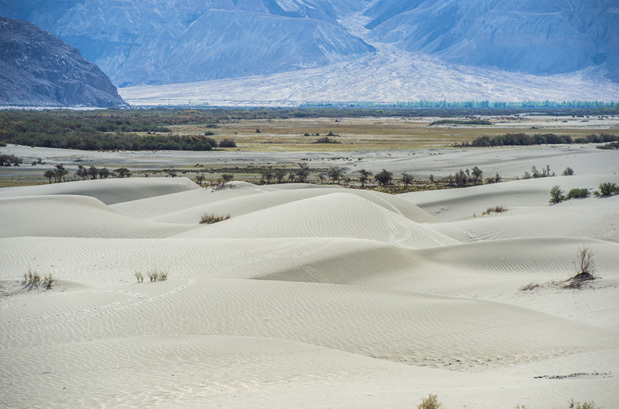 Foreign nationals are required to get a protected area permit (PAP) to visit the Nubra Valley. Since 1st May 2014 Indian citizens are no longer required to get an Inner Line Permit to visit the valley. By Air: Leh Kushok Bakula Rimpochee Airport is the main airport in Leh City. It has a number of flights that connect Leh with Delhi as well as with few major cities of India. By Road: Leh is connected to the rest of India by two highways: NH 1D (Srinagar-Leh Highway) and Manali-Leh Highway. The Srinagar-Leh Highway passes through Kargil and Zoji-La (3505m), whereas Leh-Manali Highway passes through famed Rohtang Pass and Tanglang La (5325m). It also passes through the upland desert plateau of Rupshu whose altitude ranges from 3,660 m to 4,570 m.
Today, we shall go on a sightseeing tour to some important monasteries in the area. We will be visiting Shey Gompa, which was once the summer capital of Ladakh kings; Thiksey Gompa, which is said to be one of the most beautiful structures in Ladakh and the famed Hemis Monastery belonging to Drukpa Order. Overnight stay at the guest house. Today, we will drive to Kyagar Village via Khardung La, the highest motor-able road in the world. Explore Samstanling Monastery and the small human settlements. Overnight stay in the hotel. 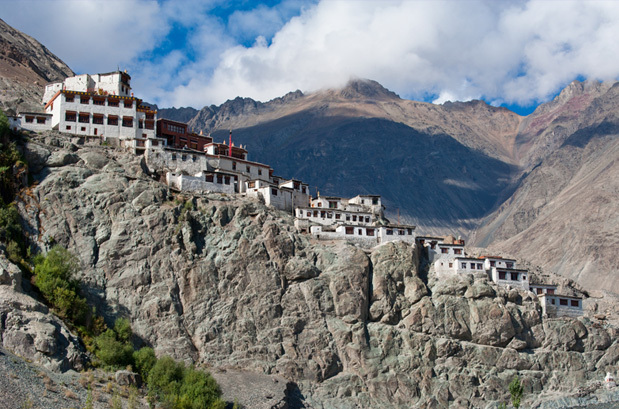 Today, we shall drive to Diskit Monastery to our first camp placed in Hunder. At Hunder, if possible, we will arrange a short ride on Bactrian Camel. Post breakfast, we shall begin our trekking through an incredible valley to shepherd's huts positioned at Skarchen (3800 meters) at the confluence of 2 streams. It is here that we will set the camps and have an overnight stay. Our trek will be to Brok Yogma, for which we will cross the tiny hamlets of Dokyogma, Wacham and Drokyogma. Camp at Sniu Sumdo. Today, we will trek up to the valley of Hunder and the Lasermo La. The camp will be set at 4800 meters elevation. We shall start early in the morning to cross Lasermo La (5420 meters) and then trek down to Phyang La. Overnight stay at the camp at about 4500 meters of elevation. Our trek for today will be to Phyang, where jeeps will be waiting to take us to Leh. Arrive at the hotel and have overnight stay. Reach the airport for your flight to Delhi. When to book Nubra Valley Trek? You should book Nubra Valley Trekking two months in advance so that you get ample amount of time to prepare for the trek. Our pick up and drop point for Nubra Valley Trek is at Leh airport. From airport, our guide will pick you and then assist you through the expedition. What is minimum age required for Nubra Valley Trek? 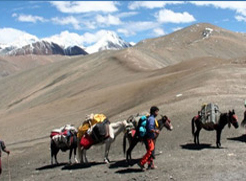 Nubra Valley Trek is a moderate trek with a maximum altitude of 5596m, so the minimum age required is 15 years. What will be the minimum temperature during Nubra Valley Trek? 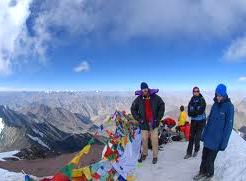 Between the months of June and mid-October, the temperature during the trek can go as low as 8 Degree Celsius during the night and by the day time it remains between 20 and 30 degree celsius. 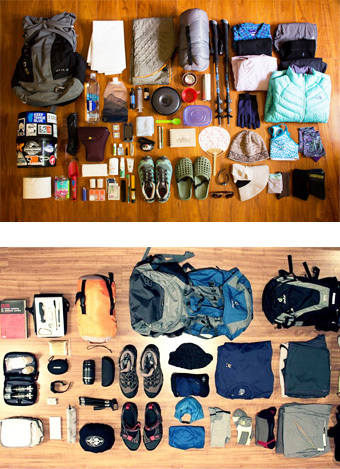 How long we trek during Nubra Valley Trek? How monsoon affects the Nubra Valley Trek? Nubra Valley trek is only conducted between the months of June and mid-October, which are the monsoon months; however, the area of Ladakh does not get affected by this rainy season.